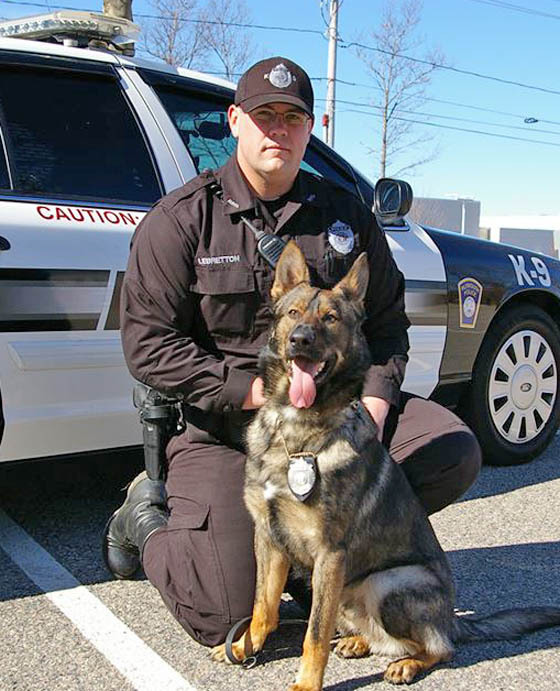 Kaiser, a 30 month old German Shepherd canine officer for the Plymouth, Massachusetts Police Department, was euthanized last Friday due to the ravaging effects of severe liver and kidney disease. Kaiser's handler, Jamie LeBretton, had announced last Wednesday that his partner had retired from the force that day. He sadly noted a ceremony at Angel View Pet Cemetery would follow Kaiser's final trip to the Court Street Animal Hospital. 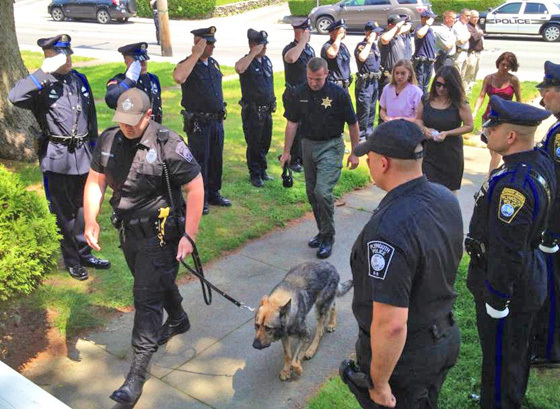 Kaiser was met by a silent, respectful group of his fellow officers, who stood at attention and saluted him as he followed his partner and friend. "I feel privileged to have had a front row seat to witness his bravery and heroic actions while serving the people of Plymouth and my brothers and sisters in blue," Officer LeBretton said. "Although his career was short-lived, he made a huge impact that will never be forgotten." Sources: Top photo, Old Colony Memorial on Facebook. Bottom photo, Plymouth Police Working Dog Foundation. Facebook page. (Photos were cropped and processed for this web page's display requirements). Robert Lee Fulghum (born June 4, 1937) is an American author, primarily of short essays. (Click for full Wikipedia article). Always trust your fellow man. And always cut the cards. Always trust God. And always build your house on high ground. Always love thy neighbor. And always pick a good neighborhood to live in. Anything not worth doing is worth not doing well. I am a fragment of a mirror whose whole design and shape I do not know. If I don't have time to live my life well the first time, when am I going to find the time to go back and live it over? If you want an interesting party sometime combine a few cocktails and a box of crayons. It doesn’t matter what you say you believe- it only matters what you do. Just when you thought that you already learned the way how to live, life changes- and you're left the same as you begun. Liberation, I guess, is everybody getting what they think they want, without knowing the whole truth. Or in other words, liberation finally amounts to being free from things we don't like in order to be enslaved by things we approve of. Here's to the eternal tandem. Making a living and having a life are not the same thing. Once you know where the roller coaster is going, are you in for the ride? Speed and efficiency do not always increase the quality of life. Until you have experienced raccoons mating underneath your bedroom at three in the morning, you have missed one of life's sensational moments. Why is love easy? I don’t know. And the raccoons don’t say. You are free to give life meaning, whatever meaning you want to give it. You will continue to read stories of crookedness and corruption- of policemen who lie and steal, doctors who reap where they do not sew, politicians on the take. Don't be misled. They are news because they are the exceptions. Everything I needed to know in life, I learned in kindergarten. Like, always check for extraneous roots when squaring to remove the radicals.